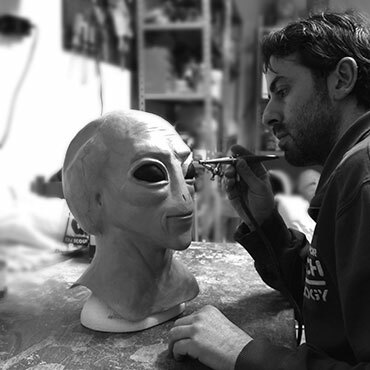 Special Makeup Studio is a laboratory specialized in the creation of special cinema effects, animatronic creatures and animals, props, fake weapons and props used in movies, fiction and theater. We can create a complete transformation of the actor with aging, fattening or zombie tricks. It starts with taking the cast of the face and then with sculptures and molds to make the silicone or latex foam implants that will be glued to the face becoming a real second skin. Hyper realistic masks in platinum and latex silicon. Our masks adapt perfectly to the face, reducing the application time compared to a classic makeup. Our models range from old-fashioned silicone masks, horror silicone masks and caricature masks to famous people. Rocco Schiavone, The Perfect Husband, Psalms, Clementino and many others. We also have a wide range of masks and accessories for sale online. Rocco Schiavone, The Perfect Husband, Psalms, Clementine, The Opening, Orloff, Striscia la notizia and many others. We also have a wide range of masks and accessories on the online sales SHOP page.